Spin This: "White Christmas," "Merry Christmas Baby," "Jingle Bells." "It's Christmas"
The blues rock formula, arrangements and the smart choice to avoid the overworn carols are all winning factors here. "Jingle Bells," although pretty good, sounds unline anything on here; it's totally an oddball. Still, it's a joy to hear Clapton in a more contemporary and groundbreaking setting. We don’t always expect our rock gods to pull off a holiday album. It’s mighty unusual of them, as if a holiday album is too beneath them. The same can be said for guitar legend Eric Clapton, who during a tricky year of stunning retirement announcements (including Elton John and Anita Baker) entertained the very thought of it due to tinnitus. But the “Tears in Heaven” legend has finally drummed up a complete disc of holiday treats, many of them fashioned in his familiar bluesy rock style. 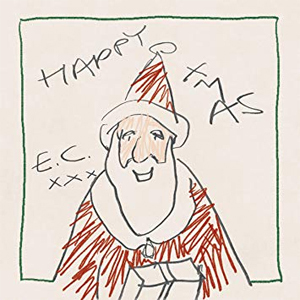 Happy Xmas, a fourteen-track set produced by Clapton and “I Knew You Were Waiting for Me” songwriter Simon Climie, is his very first shot at a holiday album. Let that moment of zen sink in. And like a mesh of Huey Lewis and Ray Charles, Clapton holds down the fort with his lead vocals, adding his sandy soul to the gritty remake of “White Christmas” and the glorious calm ballad “For Love on Christmas Day,” the only song bearing Clapton’s original pen. The latter finds Clapton pouring out his heartache from a wintry loneliness but hoping tirelessly for the gift of love: “I’m living in a dream world, dying each more each day/Yes, I’m dying for love on Christmas day.” It’s not “My Grown Up Christmas List”-worthy, nor does it stand up against Clapton’s “Layla,” but it’ll be remembered as a darn good Clapton song. Without trying to sound like conventional holiday music, Clapton stays true to his soul by putting his signature on the Stax classic “Everyday Will Be Like a Holiday” and going for joyful rock on “It’s Christmas.” The latter plays like Rolling Stones’ “Jumpin’ Jack Flash” but with jingle bells in tow. He also avoids the typical overworn jingle bell rock and syrupy Muzak holiday music. What you get are an abundance of jukejoint blues jams (“Lonesome Christmas,” “Merry Christmas Baby,” “Christmas Tears”), some sunny reggae (“Silent Night”), an American jug band track (“Christmas in My Hometown”) and a few other pleasant surprises. And it all works in Clapton’s favor as the songs are immersed in good arrangements and solid musicianship. Surprisingly enough, “Jingle Bells” is the big surprise for its ballsy attempt at putting the guitar maestro on a bevy of synthy nightlife magic. It’s unlike anything packaged here, a total instrumental fired up with riveting house-like dancefloor grooves. Its biggest flaw is a programmers’ one: it sounds unlike anything surrounding it and seems unusual in scope, but it’s a slump you’ll easily get over. To hear “Jingle Bells” with this level of swag feels like a thrust of 21st century teen spirit. And it’s dedicated to the memory of Avicii, a track that screams of his genius. Clapton on Christmas disco? Who would’ve thunk?